It is Monday evening and I am still in New York. I leave for home early Tuesday morning. 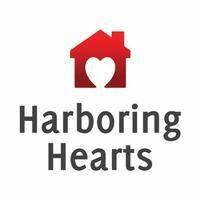 I wish I could stay for Clay’s performance at the Harboring Hearts Party, but I have obligations at home. It was so great to hear that Clay was attending the ninth annual GLSEN Respect Awards. This was an event that “honored extraordinary allies in our safe schools movement – as well as those who serve as strong role models for our nation’s youth. On Monday afternoon, my friend and I went to the 911 Memorial. The weather was miserable…it was raining and the wind was beginning to swirl around the area. But, I am so glad I went. Like many people, I have a personal reason for feeling the need to visit the site. Somehow, visiting this important site was just the right thing to do. It helped put the Celebrity Apprentice fiasco into perspective. We then took a cab to Juniors and had some “comfort food.” It was so fun to concentrate on all the positive memories of Clay Aiken on Broadway. I was lucky enough to see Spamalot more than once. I loved each show. Perhaps my favorite memory was being the peasant on the show. I was “on stage” with Clay!! Sometimes memories help put a smile back on your face. Lets give it a try. What is your favorite memory of Spamalot? Was there one funny or touching moment that you will cherish forever? It is always fun to share these things. I will never forget the feelings of Sunday, but hopefully it will bring positive things to Clay. Trumps obvious bias just might backfire! When I get home, I will have the time to actually visit some of the reviews of Sunday night. Thank you all for patience these last few days. the "Winner" and so is NIP!! Happy you made it to the 911 Memorial! Clay, you lost because you went down on Trump's pet Dayana, period. An obvious mistake! Lisa got the boot right after Dayana for the same reason. It was my first time visiting NYC and my first Broadway show. Seeing Clay perform in Spamalot was extra special since I was there with dear friends. How proud we were of him. That man could do anything! We had our photos taken with Clay for charity and will always cherish that special time we shared with him and each other. stood outside the theater during the whole performance just waiting for Clay to come out so we could be the first ones in line at the stage door. We shook. shivered, talked, and walked for two hours after eating at Juniors just waiting to see our MAN. We accomplished our goal and got to stand within inches of Clay as he signed something we had. The next two nights we saw him and loved every minute of the show. That was my last trip to the city. I'll travel to the ends of the earth to see Clay. Yes, I am so disappointed, mad, disheartened, but hopeful at the same time. I know All is Well!!! I guess what is done is done. I feel heartbroken for Clay, because I truly believe he won Celebrity Apprentice. I hate the feeling of Clay got robbed again! But it is true. Clay is the better person, and will move on. He did what he set out to do, bring awareness to The National Inclusion Project, and make money for his charity. And prove that he is a smart and funny man. Mission Accomplished. Plus Clay did not have to beg for the title. He is his own man, and couldn't be more proud of him. Now Spamalot. There were so many good memories from the times I saw it. Loved the show. Loved everything about it. Then of course meeting with other fans at Juniors, laughing and just have the best time. I cannot wait to see what Clay is up to next, and I sure want to hear him sing again. I think we need Clay right now for that. It will help ease the pain. At first my heart was broken that Clay didn't win. But after thinking it over I got a new perspective. It was nine years ago, that Clay came in 2nd on AI. Look where he is now! Being on C.A. has introduced Clay to so many new people and he has made good friends in the process. He raised big money for his charity and even Trump couldn't point at Clay and say "You're Fired!". Instead he said "There are no losers here". I think Trump is trying to help Arsenio get his career going again and he took this opportunity to do it. Remember when one door closes, check for that open window. Thanks again, Musicfan, for keeping us in touch with all things Clay. P.S. 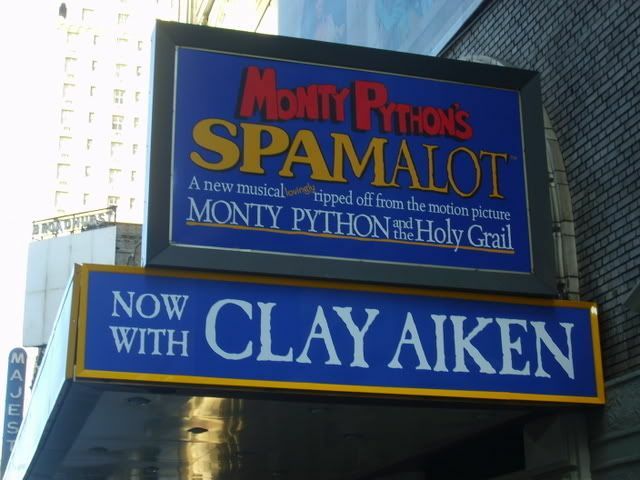 I did get to NYC twice to see Clay perform in Spamalot. First time in the 2nd row on the right. Clay stood right in front of us and because I couldn't take my eyes off him, I missed a whole number. Next time center section further back. That time I saw the whole show and could appreciate it even more! We should be all proud of Clay and no sour notes my friends. Mr. Aiken did his best and in our hearts he won this one hands down. Arsenio Hall is a legend and to have our man's respect and friendship says a thousands of things about OMC. I wish them both success and hopefully respective careers will soar high again. Posting to let you know I love this site. You have kept me informed so well. Thank you. I am still trying to pick myself up from Sunday. It is hard, but I love reading about the excitement and love that is turning this around. No doubt that Clay will get more from this than Arsenio ever will. In our eyes and in the eyes of many Clay is the winner. He has gained so much respect by his actions and the world now sees him as we have always known and loved him…the true measure of a man. As for Spamalot, I saw it 5 times, but I shall never forget the first sight of him when he appeared at the tower window. My heart burst with pride. I have so many fond memories of seeing Spamalot that I can't pick just one. I really hope Clay is back on Broadway soon especially since I can easily hop on a bus to NYC. My favorite memory about Spamalot? Everything :0) I simply loved everything about it! I saw it twice and it was my first time seeing Clay. But my absolute favorite memory? Getting his autograph at the stage door, and being able to tell him that I had travel from Iceland just to see him (it only took me 12 hours but he is worth it). My flight arrived so late so I knew that I wasn’t be able to see Spamalot my first night in NY with my friends (they arrived a little bit earlier and went to see it). So we decided that I was just going to wait for them in the lobby. When I arrived the people there were so nice, but asked if I didn’t want to get something to eat and just come back, but I said now, I was finally in the same house as Clay, I could hear his voice, I wasn’t going to move :0). The next night I saw the show, and it was……. Wow! A total stranger said to me “in all my live seeing Broadway shows I have never seen anyone enjoying a show as much as you did”, my friend said that I looked like a child at Christmas, so I guess that my face showed who I was felling. Thanks for your reports! Wish too that you could stay for the event Tues night… someone will be there to give us a report, I'm sure! Spamalot moment…. I too was the peasant…. got up there, of course Clay knew who I was, I was looking at him and the king started singing in my ear and I turned to him just as they took the pix… so my pix is the side of my head looking away from Clay! Eeek… But Clay did sign the pix at the Stage Door! But each of my 8 shows were fabulous! I even went to the one in SF for my 9th show, of course it was a real let down with no Clay! Error: Error validating access token: Session has expired on Tuesday, 21-Aug-18 16:13:01 PDT. The current time is Saturday, 20-Apr-19 01:48:13 PDT.